Christina Haslage graduated from Kent State University in 2010 with a Bachelors in Art & Sciences and in Deaf Education. She has volunteered at Children’s Developmental Center in Amherst, Ohio from 2004 to 2007 and Special Olympics Hoops at LCCC in Lorain, Ohio from 2006 to 2015. 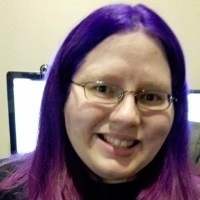 In 2008, she began volunteering with Ohayocon in Columbus, Ohio starting up their Accessibility Services which serves attendees with disabilities. During that year, she also began a part time job at Kent State University as an American Sign Language mentor until her graduation in 2010. Her experiences with non-profit organizations stems from her time at Kent State University American Sign Language Club starting as their webmaster in 2004, eventually becoming its president from 2007 to 2008. Before that, she worked at Geauga United Way in Chardon, Ohio from 1998 to 2001 as a part-time under Ohio’s Job Training Partnership Act (JTPA) program which is now WorkForce Investment Act (WIA) performing clerical duties. She was an adjunct instructor at Kent State University in Kent, Ohio serving different branches from 2010 to 2014 before moving to Texas with her husband Christopher.